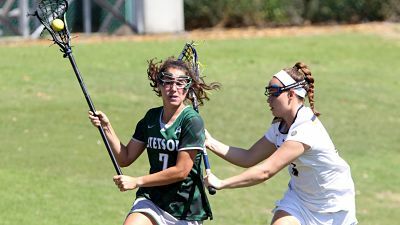 Three different players scored four goals each to lead Stetson to a 20-4 ASUN Conference lacrosse win Friday at Howard. Riley Reagan, Marina Rotella and Saige-Lyn Gidzinski all scored four times as the Hatters (3-9 overall, 2-2 ASUN) rolled past the Bison (0-9, 0-3). This game was all Stetson from the start. The Hatters opened play with two quick goals by Sarah Flatt and Rotella and, after the Bison got on the board, Stetson ripped off three more goals – including a pair by Reagan — for a 5-1 lead. Howard momentarily stopped the Hatters’ surge with a goal at 22:08, but Stetson kept coming, scoring nine straight goals to close out the half with a 14-2 lead. The second half was more of same. Playing with a running clock, the Hatters out-scored Howard 6-2 in the final 30 minutes of play, getting two goals from Gidzinski. Not surprisingly, the Hatters dominated the stat page as Stetson out-shot Howard, 38-8, and won 20 of 24 draw controls. Though she scored just once, Shelby Lehmann continued her recent assists binge, getting seven more on Friday. The ASUN leader in assists, she now has 19 over her last three games. The Hatters next visit Delaware State for a non-conference clash, 1 p.m., Saturday.